In 2016, local governments implemented targeted measures to alleviate and eliminate poverty, and accomplished the task of lifting 10 million people out of poverty. But why the war against poverty is getting harder at each succeeding stage? In an interview by Minsheng Weekly, Liu Yongfu, Director of the State Council Leading Group Office of Poverty Alleviation, gave the answer. 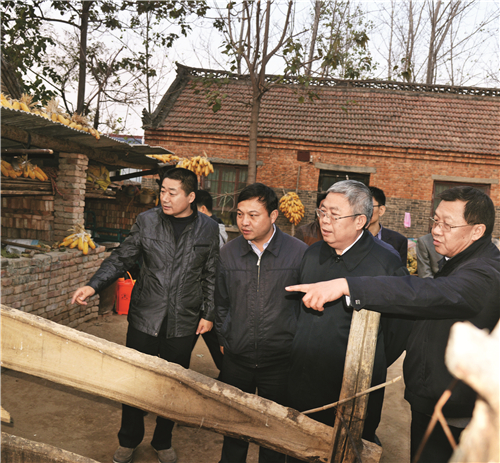 Liu Yongfu (second right) visiting the animal husbandry facilities of poor households in Zhangzhuang Village, Lankao County, Henan Province, on November 20, 2014. Liu Yongfu: Since the 18th CPC National Congress, the CPC Central Committee under the leadership of General Secretary Xi Jinping has treated fighting poverty as the number one priority related to living standards. It has worked on a raft of comprehensive measures in accordance with the overall plan for promoting all-round economic, political, cultural, social, and ecological progress and the Four-Pronged Comprehensive Strategy. By 2020, we are expected to win the war against poverty and wipe out poverty in the rural areas as a whole. No one should be left behind on our journey toward prosperity. This goal requires that we lift some 10 million rural residents out of poverty every year of the 13th Five-year Plan (2016-2020). This is a significant target, and it is getting more and more difficult to achieve as we move forward. This is the objective reality we have to deal with. Since the poverty alleviation standard has been raised, it will be all the harder to lift such a large number of people out of poverty and to keep the numbers up at such a high level of 10 million. There are many challenges. The poverty headcount ratio stands at around 20% in 14 contiguous poor areas, and particularly in Tibet, the Tibetan-inhabited areas in Sichuan, four regions in southern Xinjiang Uygur Autonomous Region, Liangshan, Nujiang, Linxia and other remote regions inhabited by ethnic minorities. These regions suffer from hostile living conditions and multiple other factors leading to persistent poverty. They are handicapped by significant shortcomings in infrastructure and public service provision, therefore it is extremely difficult to achieve the goal of lifting them out of poverty. Some 128,000 out of 500,000 villages have been documented as villages in need of help in China’s war against poverty, accounting for 20% of the total. These villages host 60% of all the poor population in the country, and around one-third of them have a poverty headcount ratio that remains stubbornly above 20%. By the end of 2016, the poverty headcount ratio nationwide had been reduced to 4.5% - the huge gap between these regions and the national average means we are facing a tough battle ahead. In China today, low incomes are only part of the reason behind poverty. Most poor people do not have a problem in feeding themselves. At present, most poverty is expenditure-related. What we mean by expenditure-related poverty is that poverty is caused by unsustainable expenditure attributable to factors like ill-health and education. Another heavy burden is lavish spending on weddings and funerals, as the practice of “keeping face” has long been hardwired into people’s minds in many impoverished regions.